French scholastic, philosopher, and theologian—the boldest thinker of the twelfth century; born 1079 in a small village near Nantes, France; died 1142 at the priory of St. Marcel near Châlons-sur-Saône. Abelard was one of the most acute, most rationalistic, and most contentious of the Christian theologians of the Middle Ages. Just as he was reaching the height of his fame as a theological teacher, he became involved in a love affair with Heloise, the niece of Canon Fulbert, whom he secretly married; she, however, steadfastly refused to allow him to wreck his career by owning her as his wife. Her relatives wreaked their vengeance on him by emasculating him. The rest of his life was spent in monasteries, where, with broken spirit, he labored diligently to the end, being greatly hampered by the necessity of maintaining an orthodox position. Abelard lacked the courage of a martyr, and, though radically opposed to the dominant Catholicism of the age, weakly yielded to ecclesiastical authority. There is no evidence of his acquaintance with medieval Jewish philosophy, which had then begun to influence Christian thought. He pictures Heloise, his pupil and wife, as learned in Hebrew; and he must have had some acquaintance with the language, for he complains of its neglect by his contemporaries, though there is little evidence in his writings of its effective use. His "Colloquy between a Philosopher, a Jew, and a Christian" is intended as an apology for Christianity. 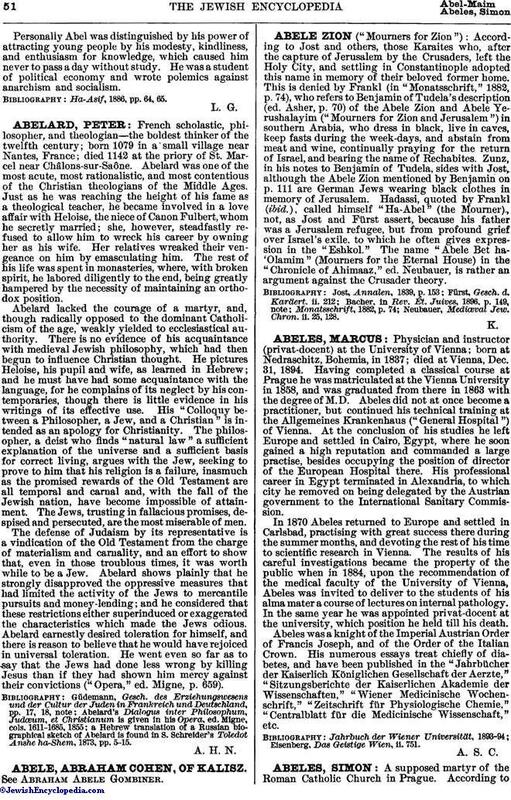 The philosopher, a deist who finds "natural law" a sufficient explanation of the universe and a sufficient basis for correct living, argues with the Jew, seeking to prove to him that his religion is a failure, inasmuch as the promised rewards of the Old Testament are all temporal and carnal and, with the fall of the Jewish nation, have become impossible of attainment. The Jews, trusting in fallacious promises, despised and persecuted, are the most miserable of men. The defense of Judaism by its representative is a vindication of the Old Testament from the charge of materialism and carnality, and an effort to show that, even in those troublous times, it was worth while to be a Jew. Abelard shows plainly that he strongly disapproved the oppressive measures that had limited the activity of the Jews to mercantile pursuits and money-lending; and he considered that these restrictions either superinduced or exaggerated the characteristics which made the Jews odious. Abelard earnestly desired toleration for himself, and there is reason to believe that he would have rejoiced in universal toleration. He went even so far as to say that the Jews had done less wrong by killing Jesus than if they had shown him mercy against their convictions ("Opera," ed. Migne, p. 659). a Hebrew translation of a Russian biographical sketch of Abelard is found in S. Schreider's Toledot Anshe ha-Shem, 1873, pp. 5-15.